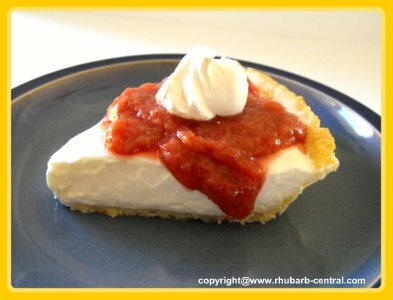 This is the very easiest No-bake Rhubarb Cheesecake Recipe available! It is also much lighter than most cheesecake recipes because it makes three cakes, but uses only two packages of cream cheese. This is my all-time favourite cheesecake to serve when the whole family is over - everyone loves it! This recipe is so easy, and inexpensive :) to whip up! 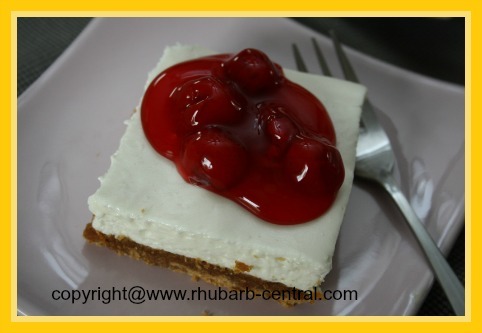 You can also make this cheesecake with any other fruit topping or fresh fruit that you desire. In a large bowl, using an electric mixer, beat the cream cheese, the sugar and the lemon juice together, until the sugar is well dissolved. In another bowl, whip the dessert topping with the milk, as the package directs, until topping is stiff. Fold the whipped dessert topping into the cream cheese mixture, mixing until well combined. Pour the cheese mixture into 3 prepared crusts, about 2/3 full, leaving room for the topping of rhubarb sauce..
Chill for at least 4 - 5 hours before serving. Cut piece of cheesecake, transfer to the individual dessert plate, and then add the sauce, or cut the cake, then add the sauce and then serve. I like to cut the cake before adding the topping because it makes neater pieces! 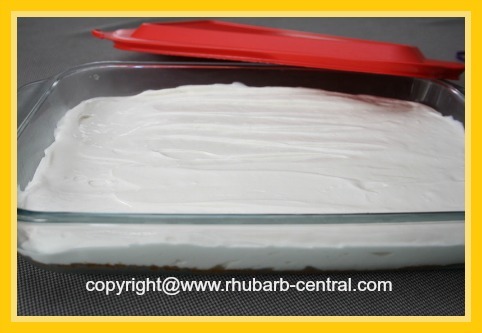 ♥ I make this no bake cheesecake recipe many times throughout the year. 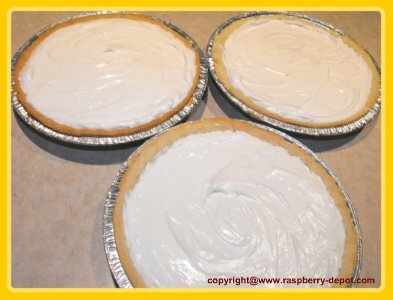 It is lighter than most cheesecakes, and you can add any type of seasonal fresh fruit, fruit syrup or sauce, or, another favourite topping is - canned cherry pie filling ... so yummy!! Instead of a making 3 cheesecakes, you can make this recipe in a 9" x 13" glass baking dish using a graham crumb crust for the base. Here is a no-fail recipe for a good crumb crust. I made this (see above and below) Cherry Cheesecake using the cheesecake recipe on this page and the crumb crust here.